Blues dominate but have to settle for a point. This game probably came 24 hours too early following the derby as despite dominating the possession, corners, chances and forcing Newcastle into picking up no fewer than five yellow cards, Everton just couldn’t find a winning goal. Everton and Marco Silva were no doubt pleased to have this fixture so soon after the fine performance but disappointing outcome in Sunday’s derby, in order to keep the recent level of performance up. Newcastle arrived on the back of 0-3 loss to West Ham at St.James’s Park so a wet pitch in front of yet another sell-out Goodison crowd seemed tailor-made for an entertaining Wednesday night game. With a couple of fitness doubts from Sunday to assess, Marco Silva‘s only pre-game hint was that Ademola Lokman was in contention to make his first league start of the season. Leaving it as late as possible, Marco eventually named the starting eleven with three changes in it: Pickford, Digne, Mina, Zouma, Coleman (c), Gana Gueye, Gomes, Sigurdsson, Lookman, Tosun and Richarlison. On the other bench, former RS boss Rafa Benitez was unable to select Matt Ritchie due to a one-game suspension, and both Paul Dummett and Isaac Hayden through injuries. The manager we affectionately dub the FSW also made changes as he named his side: Dubravka, Yedlin, Lascelles (c), Fernandez, Schaer, Manquillo, Murphy, Diame, Sung-Yeung (Ki), Diame, Atsu and Rondon. In charge of proceedings on a damp evening under the Goodison lights was another from the Manchester area, the follicle challenged Lee Mason. A quite amazing first half saw the honours even at the break with Everton coming from behind and have two gilt-edged chances blocked by Fernandez and Dubravka respectively. 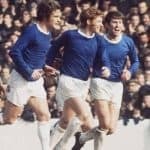 Everton attacked the Gwladys Street first half and dominated the early possession, passing the ball around neatly but not overly threatening the Newcastle defence. The first decent chance saw Tosun head wide from a Digne cross off the right wing on 13 minutes ahead of Dubravka punching clear a Gomes cross looking to find Coleman in the area. The Bullens Road in particular howled for a foul on Lookman while Newcastle broke away and Rondon was at the back post to get on the end of the right wing cross to find the roof of the net on 18 minutes. The Blues responded with a powerful shot from Digne being saved. It was game on as the next Everton attack saw Richarlison blocked on the edge of the box and Newcastle broke quickly to see Rondon screw his shot well wide. Everton weren’t quite firing on all cylinders and needed to stay calm and work the problem and a good move involving Gomes finding Coleman to play a one-two with Lookman forced yet another in a long line of first half corners. Everton were denied an equaliser on 35 minutes as Digne did brilliantly to reach a ball on the right and cross to find Sigurdsson who controlled, picked his spot but gave Fernandez that split second he needed to get into a blocking position. Dubravka then went full length to his left to turn a Richarlison shot away for another corner from which the tying goal came. Sigurdsson swung it to the back post where Newcastle were unable to clear and Richarlison gleefully thrashed the ball home from three yards. Right on the 45 minutes, Gana Gueye getting forward fed Digne for another right wing cross that found Tosun inside the six yard box, but Dubravka spread himself to block and clear. Another steady start to the second half saw Newcastle almost catch the Blues cold as Atsu swung in a cross from the right that nobody could get on the end of. 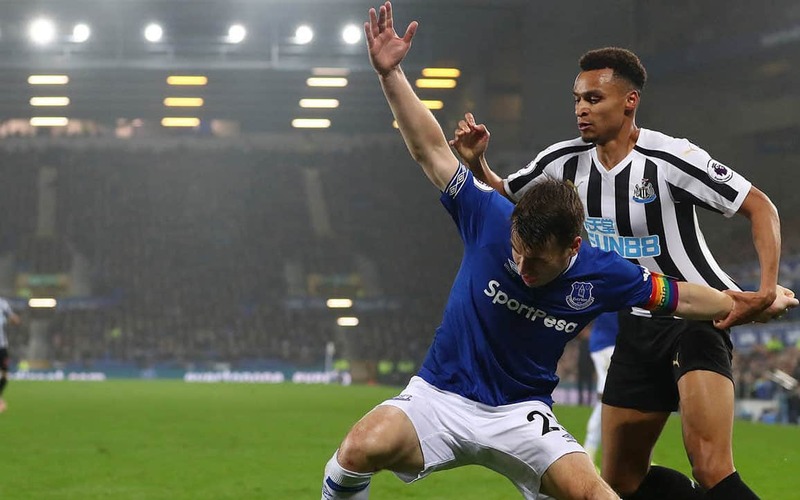 Everton were still not fluid or precise enough with their passing allowing Newcastle some respite despite the Blues dominating the possession. Pickford drew applause for a routine but confident save from Atsu on a rare Newcastle attack ahead of Diame getting booked for a stiff challenge on Richarlison. On 63 minutes, Benitez withdrew Murphy in favour of Perez and five minutes later, Marco Silva responded with a double change, Bernard and Theo Walcott replacing Tosun and Sigurdsson respectively. The changes saw Lookman switch wide left, Richarlison into the middle with Walcott in his accustomed right wing role. Joselu replaced Rondon on 73 minutes as Benitez sensed Everton were flagging a tad after their exertions on Sunday. A quick and perfectly placed long ball from Pickford found Walcott in space but he delayed and saw his shot pushed away for a corner. DCL replaced Ademola Lookman on 78 minutes as Marco Silva looked for a late winner. Yedlin was booked for a foul by the corner flag ahead of two Everton penalty appeals for fouls on Mina. Everton kept going forward but Newcastle were now defending even more resolutely and looking to break and Pickford again had to be alert to turn away another effort from Atsu. With Fernandez, Schaer and Atsu all picking up late bookings, five added minutes were signalled, but the tiring Everton legs just couldn’t find a winner and the soils were shared.